This is an advanced Cisco training course on Cisco routing configuration. Upon completion of this course, students will be able to configure and optimize a routing domain using OSPF, EIGRP, BGP, PBR, IP SLA and construct redistribution as needed. Learn the advanced routing skills you need to provide scalability for Cisco routers that are connected to LANs and WANs as part of a medium-to-large network site. You will learn how to dramatically increase the number of routers and sites using EIGRP and OSPF techniques, instead of redesigning the network when additional sites or configurations are added. 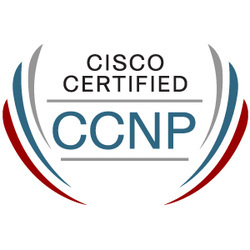 Who Should Attend This Course?This course is recommended for students looking for real-world routing experience, and those that are considering CCNP and CCIP certification. This course's discussion of routing could also benefit early CCIE Routing and Switching candidates. PrerequisitesCCNA certification (ICND1 and ICND2) This course offers the official training for the 642-902 Implementing Cisco IP Routing certification exam, which is a component exam for the CCNP and CCIP certifications. Passing this exam will also refresh CCNA certification, which expires after three years. OverviewThis is an advanced Cisco training course on Cisco switching configuration. Upon completion of this course students will be able to configure and optimize a switched infrastructure using VLANS, STP, RSTP, MSTP, and HSRP. Additionally, students will be able to secure this switched infrastructure and integrate wireless and IP telephony solutions using multilayer switches. Who Should Attend This Course?This course is intended for students who are looking for real-world switching knowledge, and those that are considering CCNP and CCDP certification. This course's discussion of switching could also benefit early CCIE Routing and Switching candidates. PrerequisitesCCNA certification (ICND1 and ICND2) This course offers the official training for the 642-813 Implementing Cisco IP Switched Networks certification exam, which is a component exam for the CCNP and CCDP certifications. Passing this exam will also refresh CCNA certification, which expires after three years. This Cisco training course prepares you for Cisco Exam #642-832, so you will gain the skills needed to maintain your complex network environments and diagnose and resolve network problems quickly and effectively. You will learn to troubleshoot and maintain particular technologies, and you will learn procedural and organizational aspects of the troubleshooting and maintenance processes. Who Should Attend This Course?The course will provide information about troubleshooting and maintaining particular technologies, as well as procedural and organizational aspects of the troubleshooting and maintenance process. The course is designed to teach professionals who work in complex network environments the skills they need to maintain their networks and to diagnose and resolve network problems quickly and effectively. A large part of the training will consist of practicing learned skills and supporting the concepts by putting them to use in a controlled environment. At the end of the course, you should have increased your skill level and developed a set of best practices based on your own experience as well as the experiences of other students that you can take back to their organizations. Prerequisites TSHOOT is designed for network engineers with at least one year of professional work experience, who are ready to advance their skills and work independently on complex network solutions. Students will learn to plan and perform regular maintenance on complex enterprise routed and switched networks and use technology-based practices and a systematic ITIL-compliant approach to perform network troubleshooting. Welcome to the CertificationKits CCNA Security Certification Center. Here you will find tons of resources to help you pass your CCNA Security 640-554 exam. You can literally spend days, weeks, months here and it is all FREE for you to enjoy and to assist you in preparing and passing your CCNA Security exam on your way to more opportunity and a better job. CCNP Security v2.0 training.CCNP Security v2.0 comprises of 4 module examinations: Once the candidates clears all the 4 modules is certified as CCNP Security v2.0 professional. The prerequisite for certifying CCNP Security v2.0 certification is that the candidates should have cleared their CCNA & CCNA Security v2.0 certification or valid Cisco CCNA certification as a prerequisite. Professionals can use the benefits of CCNP Security v2.0 certification for 3 years and recertify for keeping the certification in a valid condition or can plan forrelevant higher level advance certification to keep the validity intact of CCNP Security v2.0 Certification. Their salaries depend on the job type, experience, hiring industry and size of the hiring company.